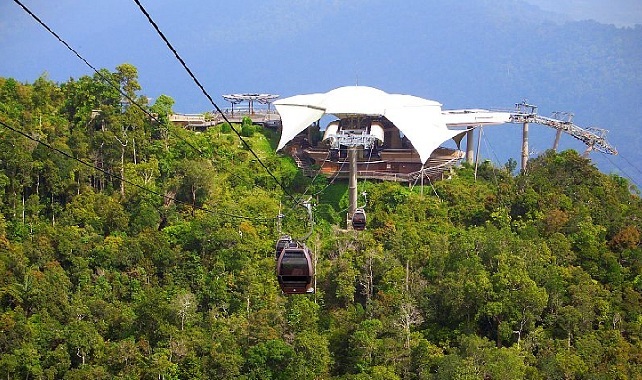 The Cable Car is one of the latest tourist attraction for Langkawi and is located at the Oriental Village, a theme shopping centre housed in 30�s individually designed buildings showcasing Malaysian and Oriental architecture. 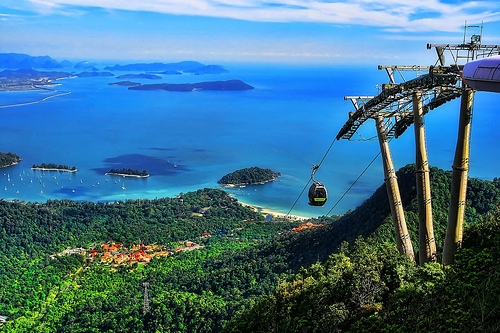 The attraction located on the south-western coast of the main island of Langkawi. It's just a 30 minutes ride from Kuah town and 15 minutes drive from Langkawi International Airport. The Base Station is conveniently located at the foot hill of the Machincang mountain range (at the Oriental Village). 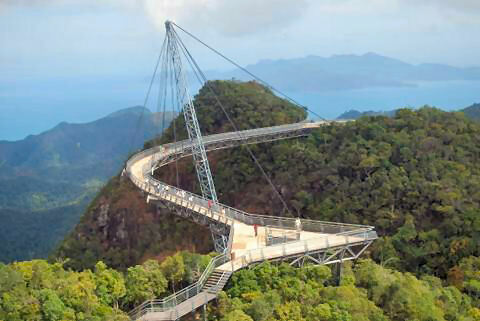 From here, the visitors will be taken up to the cool Machincang mountain range by the Langkawi Cable Car with new and modern gondolas giving the visitors panoramic views of the surroundings forests, the Telaga Tujuh (Seven Wells) waterfalls as well as the sea. Visitors will glide above verdant rainforests and the ride itself will be exhilarating experience. They will also be able to catch glimpses of eagles, hornbills and assortment of birds and wild life along the route up. The journey from the Base Station to the Middle Station is 1,700 meters in length and upon reaching the Middle Station at an elevation of 650m above sea level, visitors will be able to get off the cable car and walk up to the viewing platforms. 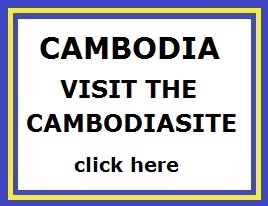 Visitors will enjoy panoramic view of the main island as well as the many surrounding islands. They will also be able to observe at close range the unique flora on the ridges and the forested valley between the Middle Station and the Top Station. After enjoying the beautiful view, visitors will then board back the gondolas, which will take them another 450 meters up to the Top Station. A short walk up the stairs from the Top Station will take visitors to the two viewing platforms at the top of Mountain Machincang (708 meter). Here you can enjoy the panoramic views of the Langkawi islands, Kedah and Southern Thailand as well as dramatic views of the deep chasms, overhangs cliff walls, isolated pinnacles and some caves. A cafe at the Top Station offers delicious refreshments and unbeatable views with refreshing cool breezes. The suspended skybridge is built on top of the Machinchang mountain. Accessible from the Top Station, the bridge is suspended from a 82m high single pylon and hangs at about 100m above ground. It swings out over the landscape to give visitors a unique spatial experience, and to bring them into otherwise unattainable locations, above virgin jungle with spectacular views. The skybridge is one of the longest curve suspension bridge in the world. The construction was not an easy feat as the solutions had to factor the following critical elements; structural balancing from a single point (top of the pylon), optimal weight management and load distribution, pre-fabrication of bridge and on site installation. The entire bridge, in all its elements had to be lifted to the top of the mountain by helicopter and was later assembled to its current position.